This page describes the general process for a workflow where the photographer is in charge of producing a final image – one that may require retouching, image compositing, and/or localized corrections. This is a workflow typical for commercial and advertising photographers, architectural photographers, and more. In this demonstration, an entire shoot is captured, and downloaded to a laptop with an ingestion utility. Back in the studio, the files are transferred to a desktop workstation. The images are rated and adjusted, converted to DNG, archived, and added to an image catalog. A proof gallery is made and sent to the client. Once the client picks favorite images, master files are created and perfected. Delivery files are made and sent off, and the final images are cataloged and archived. This workflow is appropriate for anyone who delivers Photoshop-optimized images, including corporate and advertising photographers, architectural shooters, and even fine art photographers. The embedded videos linked below show the entire workflow in action. You might want to watch them first, and then read about the workflow, or read first, then watch. 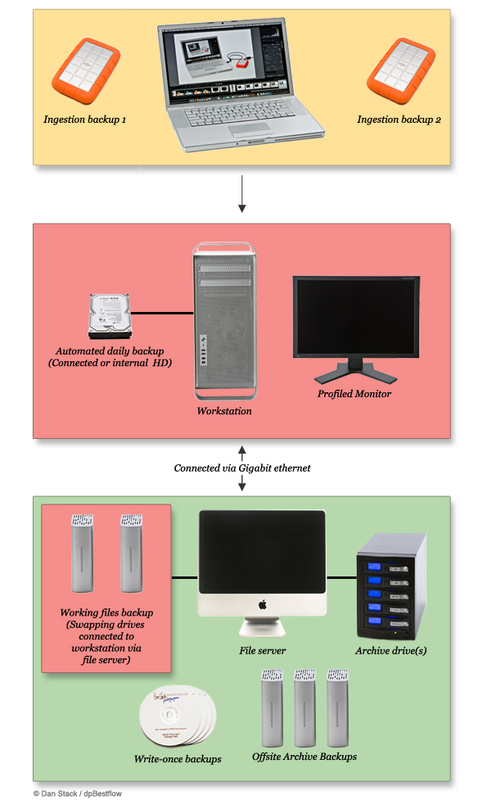 Figure 1 In the first video, the setup and process for the workflow is described. Figure 2 The second video describes the ingestion steps. Figure 3 In the third video, the raw files are processed and archived. Figure 4 This video shows the creation of master and delivery files. Figure 5The final video shows how to archive and validate the images. The bulleted list below outlines the steps for this version of an Optimized Image workflow. 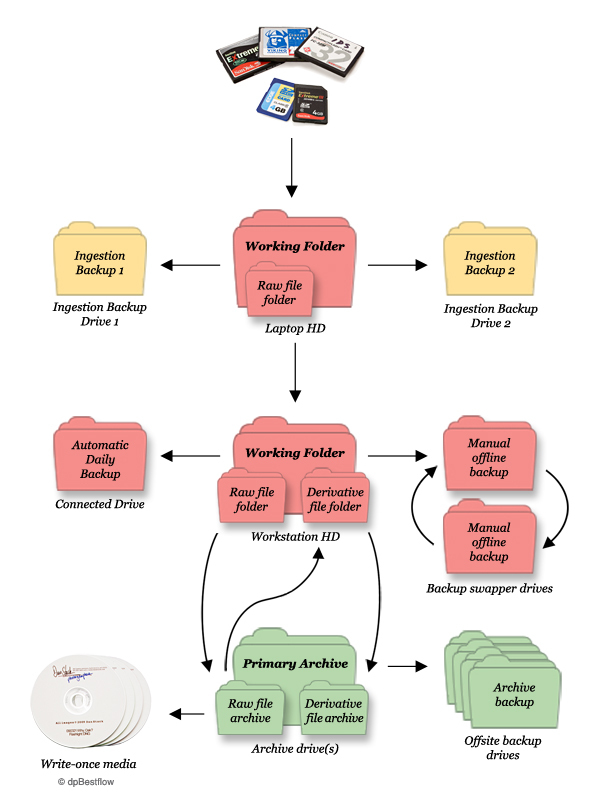 In this workflow, the ingestion is performed by ImageIngester Pro. It automates every step in this process. Images should receive a unique name. This can be done at ingestion. Images should be tagged with any information that is applicable to the entire shoot. This includes contact and copyright information for the photographer, as well as some basic descriptions of the shoot. By applying settings on download, the images will come in looking more finalized. This can include a custom profile you create for your own camera. You can do his now or later. By doing it now, you add protection to the files. Two backups of the files are made during ingestion. Images should be visually inspected if data integrity is essential. In this case, we'll look at the images in Adobe Bridge, with 100% previews selected. Back in the studio, the images are transferred from the laptop to the desktop imaging workstation, using a validated transfer utility, in this case provided by ChronoSync. Images should be rated as soon as possible. If rejects are to be thrown away, this can be done now. Once the images have been rated for quality, you can spend the most time on the best images. Catalog images with Digital Asset Management software. Create a web gallery proof and send the link to client. Move the images to the archive using a validated transfer. After the images get moved to their "permanent" home, make the "permanent" backup. How much do we want to show here? Layering? Compositing? Sharpening? After client approves the final delivered file, archive master files and delivery files. Use a validated transfer. The archive will need periodic validation. This can be a cursory validation, or a thorough one. ImageIngester Pro is shown. Additional options include PhotoMechanic and Downloader Pro. Adobe Camera Raw/Adobe Bridge. Additional options include Capture 1, Bibble, Nikon Capture NX, Canon DPP, Apple Aperture and Adobe Lightroom. Media Pro. Additional options include IDimager, iMatch, Extensis Portfolio and Adobe Lightroom. Photoshop. Additional options: you're kidding, right? ChronoSync. Additional options include SuperDuper! (Mac) and Acronis TrueImage (PC). The hardware used in this workflow is significantly more sophisticated than the version shown in the Batch Output workflow. In this case, the photographer has a complete location kit (laptop with two external drives) as well as a dedicated workstation and a server to store the archive files. In an optimized image workflow, raw files are run through an ingestion process and then evaluated to see which images should be further improved by working in Photoshop. The raw files can be archived once the proofing adjustments have been made. The best of the raw files can be sent back to the working folder and saved as layered master files. Once these files have been finalized, they can be archived.